Hi everyone, Donna Saliter here, Catherine’s webmaster for Cuisinicity.com. Catherine is taking a temporary leave of absence from her Cuisinicity blogging to concentrate on her family during a difficult time. She asked me if I could write to you all on her behalf to let you know why she has been silent lately, and also to make sure you know how much you mean to her! For those of you who live in Texas, Catherine and David will be the keynote speakers at the Viva Fresh conference in Austin on April 21 (click here and here for more info). If you can make it, she’d love to see you there and please come by for a great big hug….she could use one!! To learn more, read what her husband, Dr. David L. Katz, MD, has to say in this Huffington Post article on the standard of care in preventive medicine. He outlines 5 levels to defend against the deficiencies of an overwhelmed acute care medical system. The first level is “familial vigilance,” advocating relentlessly for family members when they are patients in the medical system. I was the primary care giver for my elderly father for three years before he passed away. Boy did he have a bad diet! One day, he had a fall and ended up in the hospital. I took the opportunity to make him some delicious and nutrient-filled recipes from my go-to healthy recipe website, Cuisinicity. Of course, I checked with his doctor first since Dad was on a prescribed diet in the hospital. I’d like to share those recipes with you because he loved them. He smiled as he ate the dishes I brought him and raved how delicious they were. They were easy to eat for my dad, who at the age of 83 also had dental issues. I think he smiled also because he didn’t really believe I could cook. Actually, he was correct. I’m not big on cooking. But Cuisinicity recipes are so easy to make! And they are healthy recipes that I believe really helped my dad regain his strength. He was able to come home again, a stronger and healthier man. If you have a loved one in the hospital, or convalescing from an illness, try some of these recipes. Of course, check with the doctor first. These healthy recipes sure did please my dad’s somewhat junk-food palate, and I know they helped his body heal. Best of all, they were easy and fast for me, the caregiver, to make and bring to him. This has to be one of the easiest recipes on Cuisinicity. Even with dental issues, my dad was able to eat them with the skin on. All you need is an apple corer and a skillet. It takes about 30 seconds to prepare, and around 15 minutes to simmer. You can then let the apples sit until ready to eat, which is very convenient when bringing them to someone in the hospital. Catherine’s recipe makes the perfect amount – just two slices – which is easy peasy to make and transport. No fuss, no mess, and again, the ingredients contain yummy nutrients – a wholegrain bread (Dad loved his bread and the wholegrain adds the nutrients he needed), almond milk and an egg for protein to start the day out strong. I like to serve it with the Simply Cinnamon Apples for a complete breakfast. 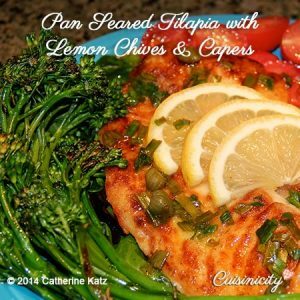 The lemon and capers add a zesty taste, and the fish is nice and mild and offers a wonderful source of protein. This is a great meal to prepare as a full noon-time dinner. 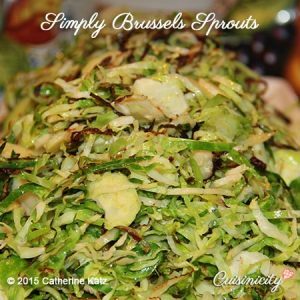 Dad loved to eat Catherine’s Simply Brussels Sprouts with the tilapia for a filling, heart-healthy dinner. Who doesn’t love a chocolate milk shake?! My dad absolutely loved chocolate. He would amaze me with the amount of chocolate he could eat, even when his appetite was down. The best thing about this milk shake is the other, “silent,” incredibly nutritious ingredients: lentils, rolled oats and almond butter. Dad could choose to drink his milk shake all at once, or slowly during the course of the afternoon, and it kept filling his body with yummy nutrients to help him regain his strength. Actually, all of Catherine’s smoothies are fantastic and delicious nutritional supplements. If dairy is an issue or if your loved one is lactose intolerant but LOVES Chocolate, she even has a vegan Cocoa Almond Oat Shake that’s absolutely delicious and creamy! Let’s face it, soups aren’t always easy to make. This soup is relatively easy. The hardest part is chopping the onions. It’s filled with vegetable nutrition too. I don’t know about you, but when I’m not feeling well, the last thing I want to eat is vegetables. This creamy comfort soup is a great and easy way to get power veggies into the belly of our infirm loved one. When Catherine visits her mom in France, she naturally takes to the kitchen. Here are two recipes Catherine made for her mom that turned out to be delectable favorites. Catherine says her mom couldn’t believe she could devour them with such joy! 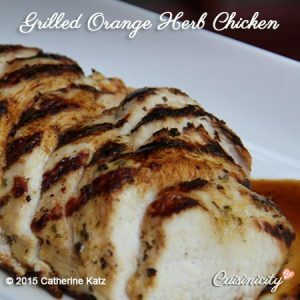 Catherine’s orange grilled chicken is so tender, juicy and easy to chew, it’s really amazing for anyone who needs to chew gently. The key is a delicious, tangy marinade made from the juices of two oranges and special herbes de Provence that seep into the chicken that she first pokes with a fork, so that it becomes perfectly tender. It has become a favorite for her Mom and she wanted to make sure I shared it with you! We end this blog post with a little more chocolate. 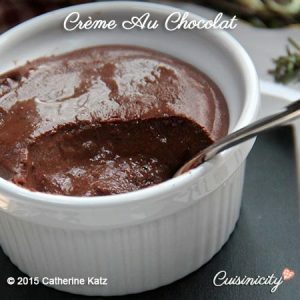 No wonder this crème au chocolat is one of Catherine’s mom’s favorites: it is so creamy and rich, it’s just like “petits Pots de crème au chocolat” that Catherine remembers from her childhood. Don’t tell Catherine’s mom that Catherine has substituted the heavy cream, egg yolks and sugar for Cuisinicity-style healthy ingredients! There are more Cuisinicity recipes that my dad came to love, and I’ll bet Catherine’s mom loves many more too. I loved that they were easy to prepare. 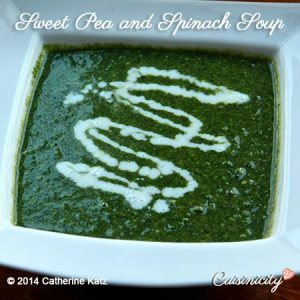 Catherine has many easy recipes to make (not all are easy! but many are), and they are all nutritious. Healthy recipes help the healing process, and Cuisinicity is THE best place for healthy recipes that help the caregiver too! 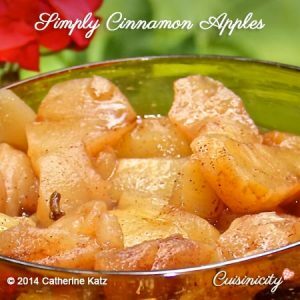 Catherine will be reposting some of her favorite blog posts for a while, while she takes care of her loved one, and, of course since she is cooking all the time for her family, you can catch her mini video clips on instagram @Cuisinicity whenever she captures the moment on her cell phone! I love those! Are you taking care of a loved one in need? 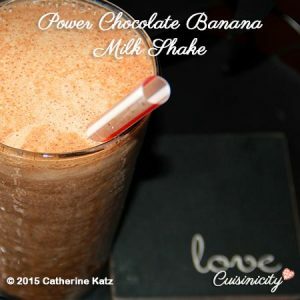 Feel free to try Catherine’s recipes and continue to comment on them. I am sure it will make her happy to know that you are still enjoying her delicious, nutritious dishes. Let us know which your favorites are! « The Freshness of Citrus! Dear Catherine,Thinking of you and your family with love. May your sweet smile and tender care bring healing to your loved one. My heart and prayers are with you and your family during this difficult time. May good health come to your family member and a speedy recovery. May you be blessed. Hugs, Catherine L.
I send you lots of strength, positive thoughts and best wishes in such difficult times, and of course a really big hug! I hope your family member and all your loved ones recover well and regain their strength fast. I am glad to know you have David as an expert at your side and lots of love around you to give you strength. All the best, do not forget to care also for you, and thanks for always being there for us! Keeping you and your family in my prayers. Thanks for all the delicious recipes that you continue to put out there even when you are going through difficult times. Thanks for all you do. Wishing you all the best during a difficult time! And thank you for sharing not only wonderful recipes but advocating for family member involvement in loved ones treatments. As much as we try in healthcare and have made some great advancements, it is a dangerous place with still a lot of room for error. I’m praying for you and your loved ones. Keeping their family in my prayers. Now the blog is wonderful, as usual. And I love most of them – ahem, I feel like a little girl again as I still don’t like brussel sprouts nor peas (but I do like snow peas – go figures!). But these recipes sound – and look – delicious. If only I could have someone make them for me. Oh dear I’d better be watchful of what I ask for! Thank you, everyone, for your thoughtful comments! Catherine, I am sending you strength and light during this time in your families life. Peace to all of you. Ever since I heard your husbands grand rounds at Dartmouth I have tuned in to your website; which I enjoy immensely. Keeping Catherine and her family in my prayers, and so thankful to her and you, Donna, for sharing. 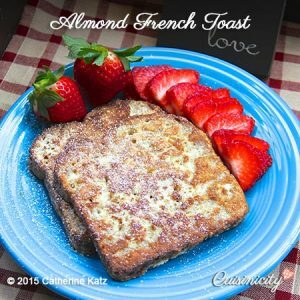 Awesome French Toast!!! It was delicious. Thanks! This looks great, Donna, and I love hearing about your Dad. The chocolate milkshake with lentils is particularly intriguing. This sounds like the type of thing my children would love, and it looks like it would fill them up too. Dear Catherine, sending prayers of healing and loving support to you and your family during this difficult time. I hope that you can feel all of the loving energy coming your way. “Do you know how many angels are with you? All of them. They insisted!” (One of my favorite quotes from Mike Dooley’s Notes from The Universe). Wishing you and your family the very best during a difficult time, Catherine. Holding a good thought for speedy recoveries. Dear Catherine, I was saddened to read the harm caused to your family member during their hospitalisation. I hope their health is improving under your watchful eye and nutritious & delicious meals. Sadly things are no different in other countries re patient harm. I too am concerned for patients that do not have medical knowledge or a family/friend to act as a patient advocate. Speaking from personal experience I thought we implemented enough measures to mitigate harm and yet significant harm still occurred to family members. Thanks as a Care Giver I can use the Help..